Once upon a time, there was a funky little desert kumbaya that got real popular as it grew up. But as things got bigger, some folks just wanted to rock up & enjoy the fruits of other people’s labour of love. They were keen on the action, but just weren’t up for working for it, or getting down & dirty in the dust. So they sought out ways to pay for their comforts, and some people were keen to provide that comfort, for a tidy profit. The End? Nope – because that’s not how Tankwa Town works. 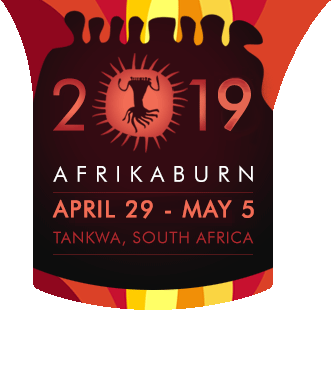 With growth in popularity, the AfrikaBurn event has experienced a rise in the commodification of our culture in the form of people and organisations that have utilised the event to turn a profit. These camps and package tours have various names: ‘Turnkey camps’, ‘Plug and Play camps’, ‘Concierge camps’. For our purposes here, we refer to them as Plug, Play and Profit Camps. Camps of this nature compromise the experience of actively participating in the creation of Tankwa Town, as well as the culture that it espouses which aspires to affect the world in a positive way. It results in people missing the fundamental point of the experience altogether and goes against the efforts of everyone else at AfrikaBurn that participate for the love of it – not the love of profit. Radical Self-Reliance, Decommodification, Civic Responsibility, Gifting, Participation and Immediacy have been highlighted as the principles that stand the greatest chance of being compromised by Plug, Play and Profit camps. (see here for a detailed explanation of the guiding principles). The development of a Supplier Process (and Supplier Gate at our event site). Read about it here. How Can You Identify A Plug, Play & Profit Camp? The camp (private or a registered theme camp) advertises or engages in commodification. There is a range of these: product placement, selling services such as putting up tents, cleaning the camp, making the meals, where participants are waited on and add nothing to collective experience. There is no toil. Your camp collaborates with concierge companies selling package tours (there is a range of these too) that involve transport, flights, hotels etc. Your camp places clients of concierge / package tour companies in your camp. If we received feedback from other AfrikaBurn departments or the community that you sold or advertised goods or services during AfrikaBurn. Your camp turns a profit which is not used to fuel future creative projects. What does that all mean? Read the Plug and Play Guidelines here. Make sure your package deal does not include a profit – insist on seeing the books if it’s not evident where the money goes. Ensure all campers have and know their responsibilities before arriving in the desert.